I've always wondered about the first basketball league. The game was invented in 1891 by James Naismith in Springfield, Massachusetts, so it would have had to have been within a decade or so. After some research, I found the "NBL" (National Basketball League) which was founded with teams in New England. So, for the past few weeks, I've been working on teams, logos, uniforms, simulating, and creating a storyline for my newest project, the ABL (American Basketball League), founded in place of the real-life NBL in 1899. This is going to be the biggest project I have ever taken on, as I plan to have up to 40 teams in 5-8 divisions by 1920, all while I will be simulating each game individually. The league originally will be based in New England, like the NBL, but will expand to include the rest of the Eastern Seaboard and the midwest over time. If I am able to stay motivated and keep this series going, I could see it expanding past the Rocky Mountains in the distant future. The ABL is owned and commissioned by the inventor of basketball, James Naismith. The ABL headquarters and future hall-of-fame are located in Springfield, Massachusetts, the original basketball city, and the most passionate fanbase. 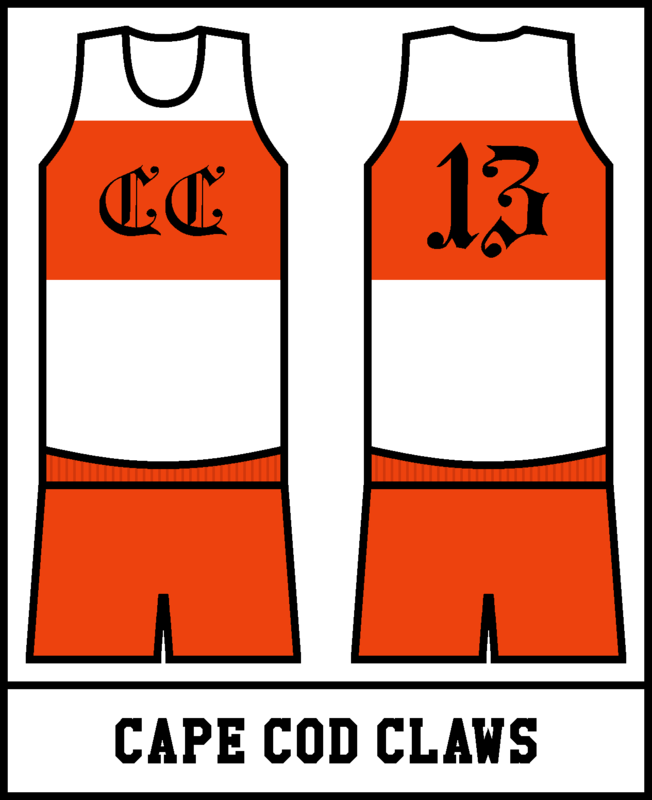 I have already designed logos and uniforms, and planned changes for the first few years, but C&C is always encouraged and appreciated! Especially on what cities I should add teams for. The league is currently split up into 2 divisions, each with four teams. Each team plays 20 games, and at the end of the season the top two teams from each division make the playoffs. They each play a 3-game series to decide their divisional champion, and who will advance the the American Basketball Championship, which is a 5-game series. I like the logos. They look like they fit for the time period. Can't wait to see where your story goes. 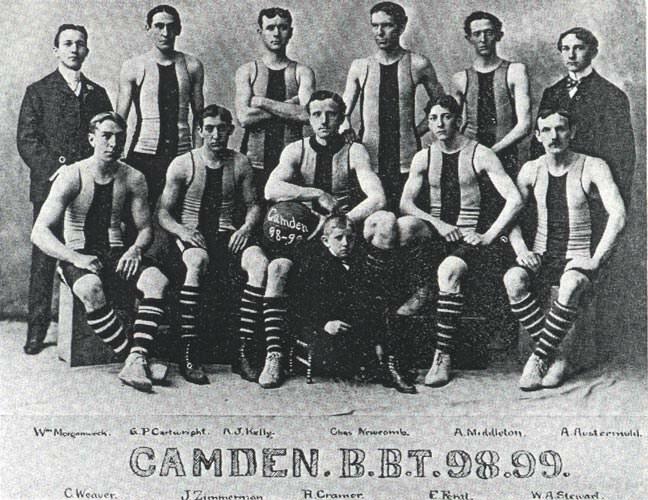 The biggest story of the 1899-00 season was the dominance of the Western Division. The Springfield Nationals, New Haven Musketeers, and Hartford Royals all had winning records, and the Amherst Alers were just a game below .500. 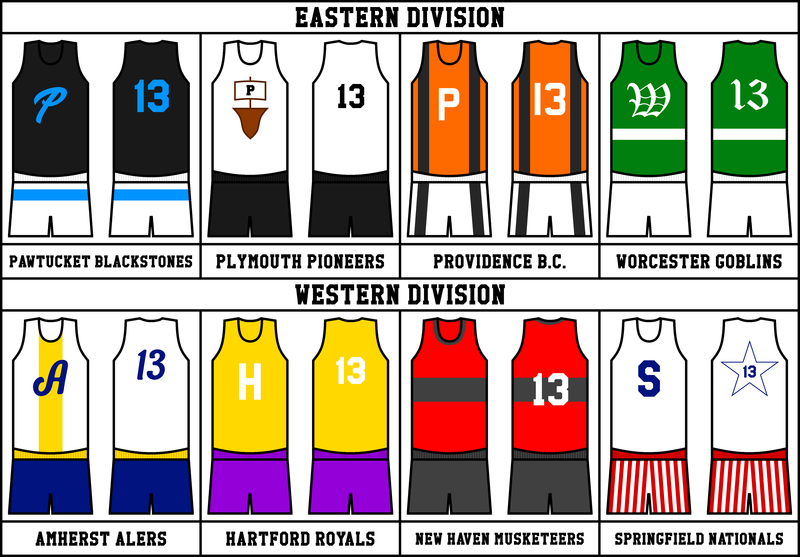 The Eastern Division had 3 teams with losing records, and the Plymouth Pioneers, who were last in the league at 1-19. The first ABL game was played between the Springfield Nationals and Hartford Royals on October 30, 1899, with the Nationals defending their home court 49-41. The Pawtucket Blackstones' run to the playoffs was led by star wing Mel Kings, who led the league with 16.9ppg. They went 9-3 in their division, and 5-3 against the West, showing just how dominant the West was, and how weak the East was. 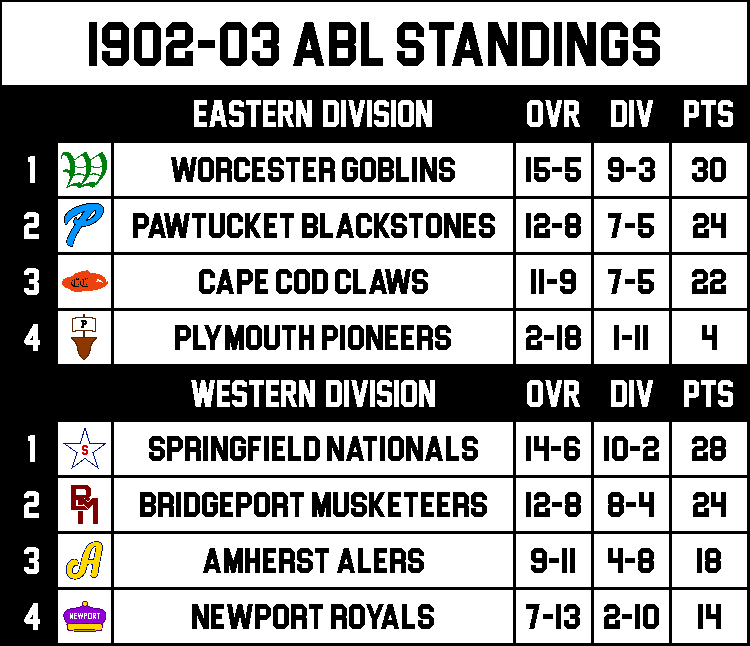 The Worcester Goblins got extremely lucky making the playoffs with just a 9-11 record, which would have put them at last in the West. They were led by forward Benny McCloskey, son of owner Gerald McCloskey, who averaged 13.4 points and 5.8 rebounds. The Springfield Nationals, despite having a worse record than the Pawtucket Blackstones, are the favorite to win it all this year. Being the place where basketball was founded, they had a leg up on the competition, with some of the most experienced players in the league. Harold Stevens and David Myers both averaged 14ppg, and forward Len Rogers led the league in rebounds with 8rpg. The New Haven Musketeers and Hartford Royals' tie was unfortunately decided by a coin flip, since both teams were 12-8, and the 4-game series was tied 2-2. The Musketeers won the coin flip, advancing to the playoffs, and sending the Royals home. The Musketeers were led by guard Walt Babson, who averaged 11 points and 7 assists. 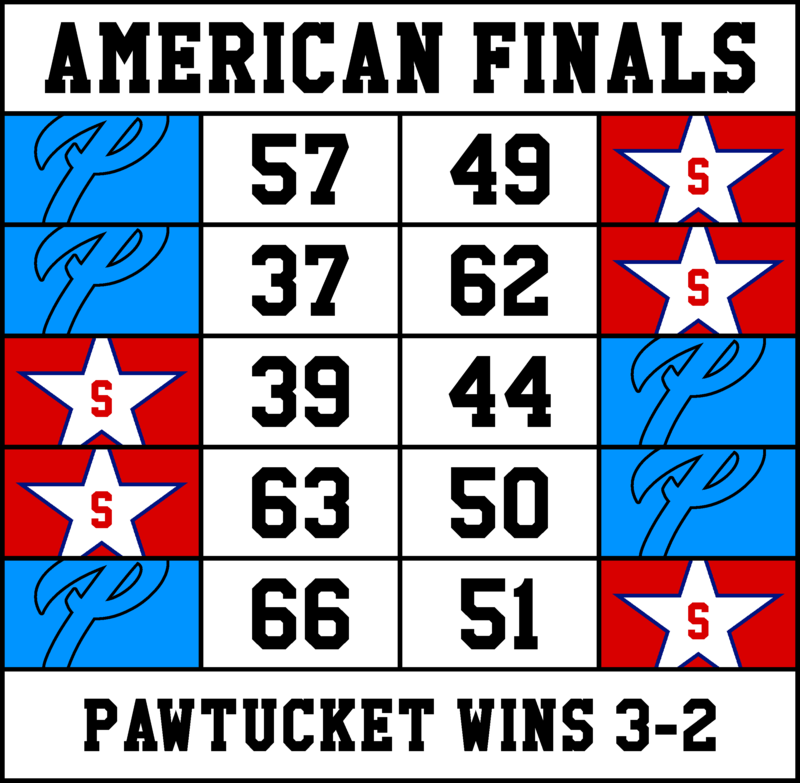 Game 1: Pawtucket easily defends home court, winning by 27. Wing Mel King scores 24 points. Game 2: Worcester comes back home after a bad Game 1 loss and defeats the Blackstones 62-59, in the first overtime game in ABL history. Game 3: Few expected the series to get this far. Worcester put up a good fight, but the size and skill of Pawtucket was too much, and they lose by 5. 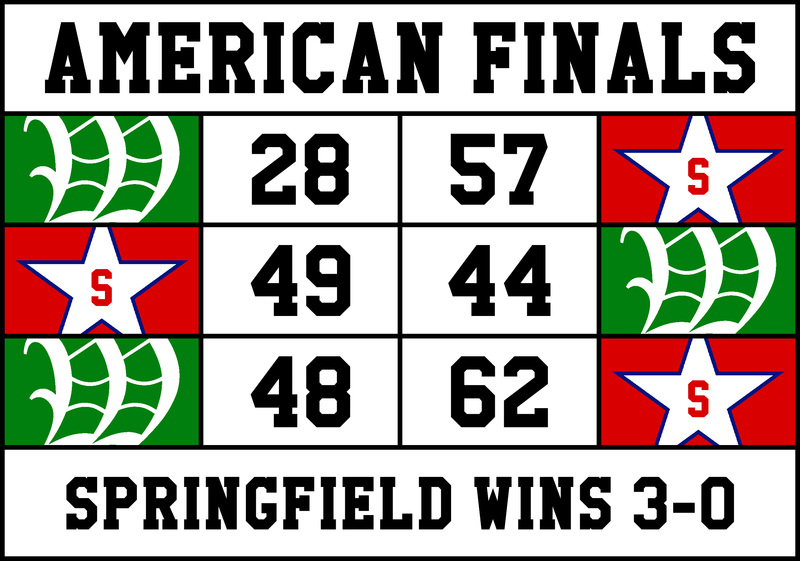 Game 1: Springfield's experienced players show just how good they can be, winning by 8 despite New Haven shooting 61%. Game 2: Springfield gets another relatively easy victory, defeating the Musketeers by 7 in New Haven. 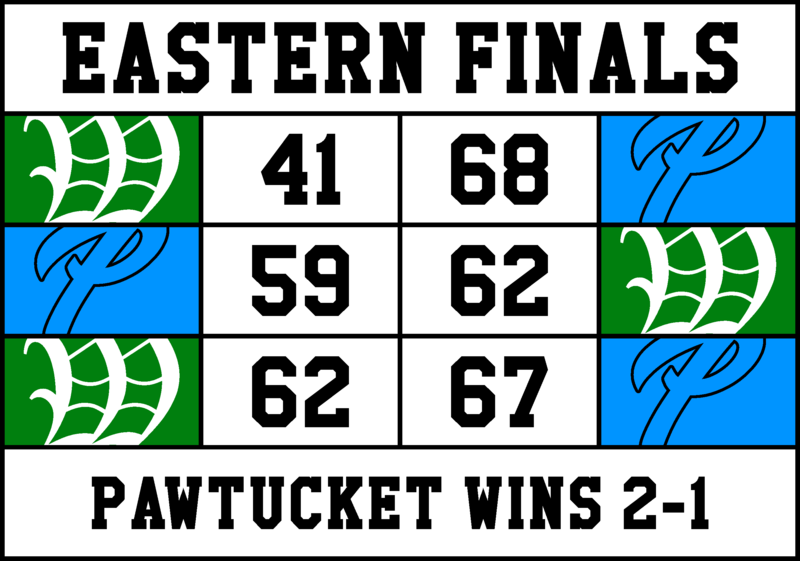 Game 1: Pawtucket comes out hot, shooting 57% and winning by 8. Mel King scores 31. 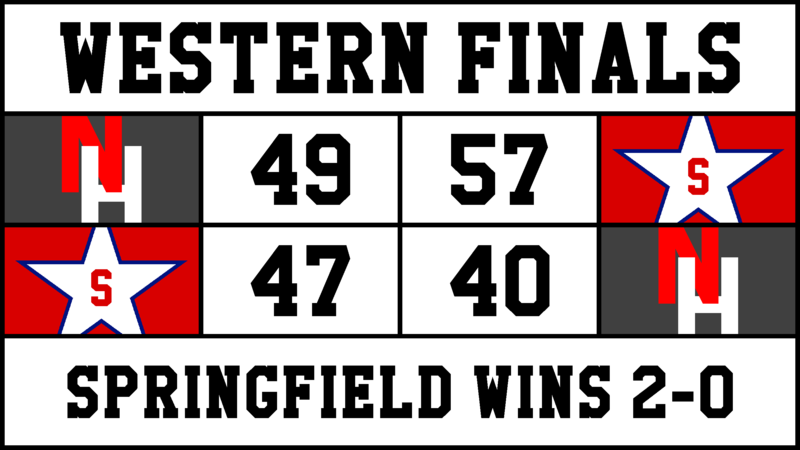 Game 2: Springfield evens the series at 1-1 with a 25 point blowout victory. Game 3: Pawtucket moves within a game of the championship, defeating the Nationals by 5. 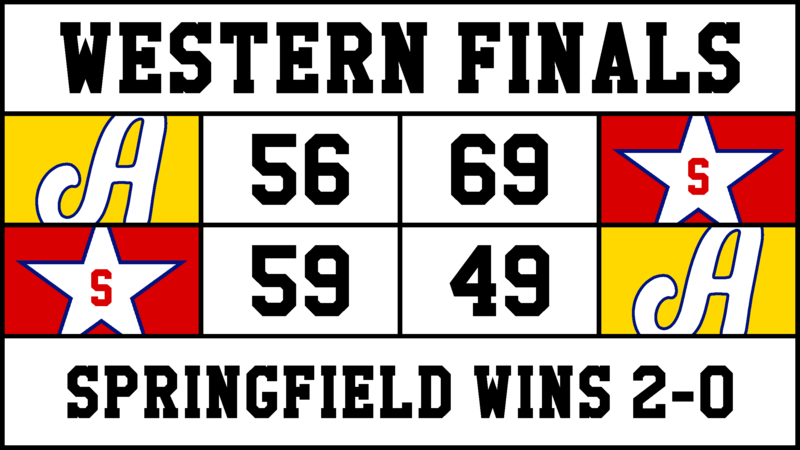 Game 4: Springfield keeps their championship hopes alive by a playoff record 38 points by David Myers. Game 5: Pawtucket wins the first ABL championship in stylish fasion, beating the Nationals by 15 in Springfield. 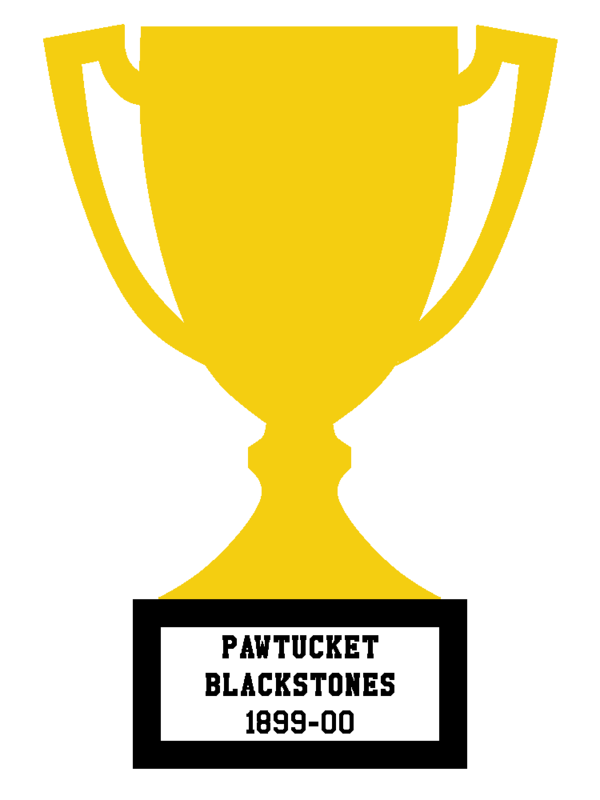 The Pawtucket Blackstones are your 1899-00 ABL Champions! C&C on anything from graphics to storyline is encouraged and appreciated! I'm into basketball currently, you can see by my recent follow-ups. This is a good idea. But I feel a lack of historic accuracy in the uniforms. It's hard to imagine those striped shorts. In this link, from a U of Nebraska Press, you can read some stuff about early uniforms. 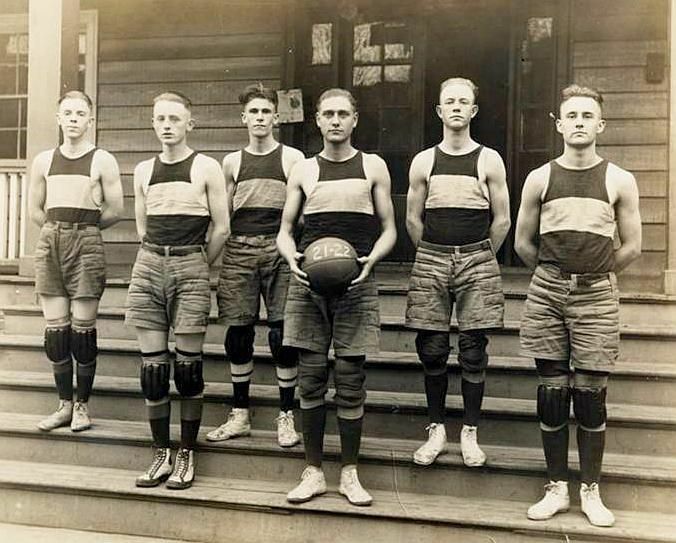 The first official basketball uniforms, as displayed in the Spalding catalog of 1901, featured three types of pants: knee-length padded pants, similar to those worn for playing football, as well as shorter pants and knee-length tights. 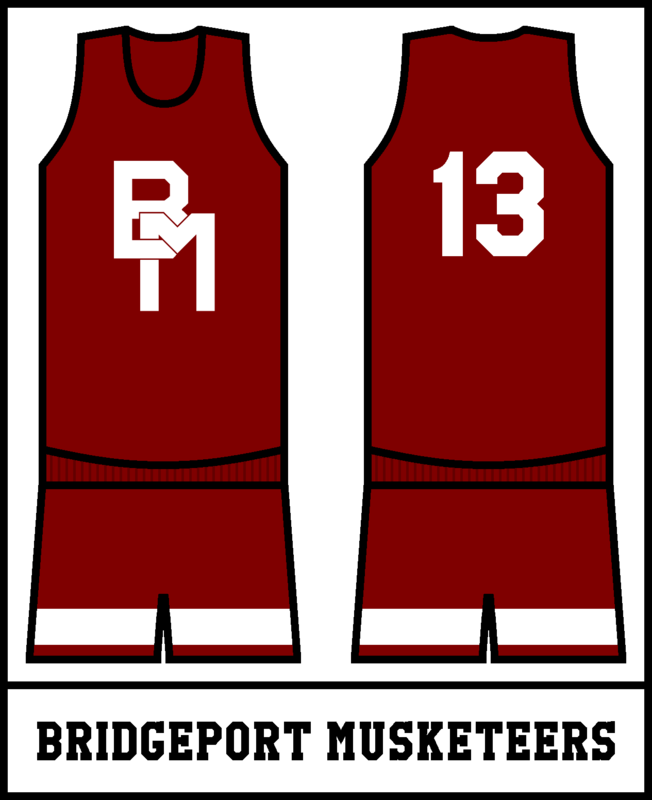 There were two types of suggested jersey, a quarter-length sleeve and a sleeveless version. 1899 uniforms still have stuff like pants, belts and shortsleeves. 1903 German YMCA from Buffalo, NY. 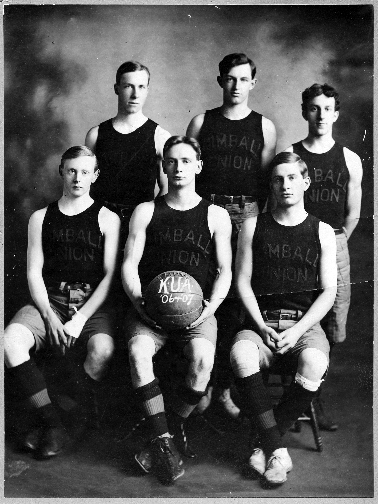 1907 Kimball union had shorts with belts. First team of University of Texas had buttoned shorts. Late as 1922, there are teams using belts and a very heavy fabric for its shorts. Thanks for the interest and comment though! Thanks Matthew! Making them look fit for the 1890's was a bit difficult, I'm glad they look good to you. This looks promising. It's hard to make logos for a specific time period, but all of these definitely look like they could have been designed in the 1890s. Graphics look good as well. This is a really awesome start. Love the feel of the league (Although i don't know Pawtucket finished the season at 16-4 or 14-6, or played 22 regular season games). Thanks for the compliments, NoE38! Thanks TargetToad. It’s a typo, I don’t have my computer with me right now... but I’m pretty sure they were 14-6, I’ll fix it (thanks for pointing it out). Owner Melvin Fox said in an interview "After seeing firsthand the success and style of the Springfield Nationals this past season, I have decided to slightly change our uniform design. We will be borrowing the idea of placing the player's number in the team's logo , in the hopes that we can have some of their success 'rub' off onto us." Remember, the Pioneers went 1-19 last year, so they are looking for any way to win more games. Fox thinks he just found the answer. C&C on the new Pioneers uniforms is encouraged & appreciated! The west was once again the more dominant division during the 1900-01 season, but the East did improve after having 3 teams with losing records in 1899-00. 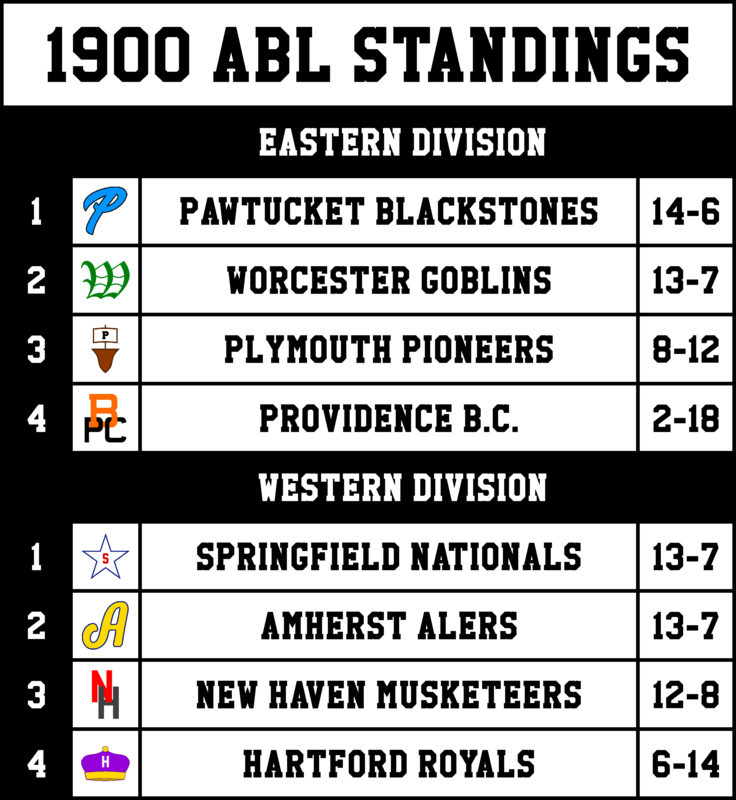 The Pawtucket Blackstones and Worcester Goblins both won Eastern Playoff bids for the second year in a row. In the West, the Springfield Nationals tied for first with a surprise team; the Amherst Alers. 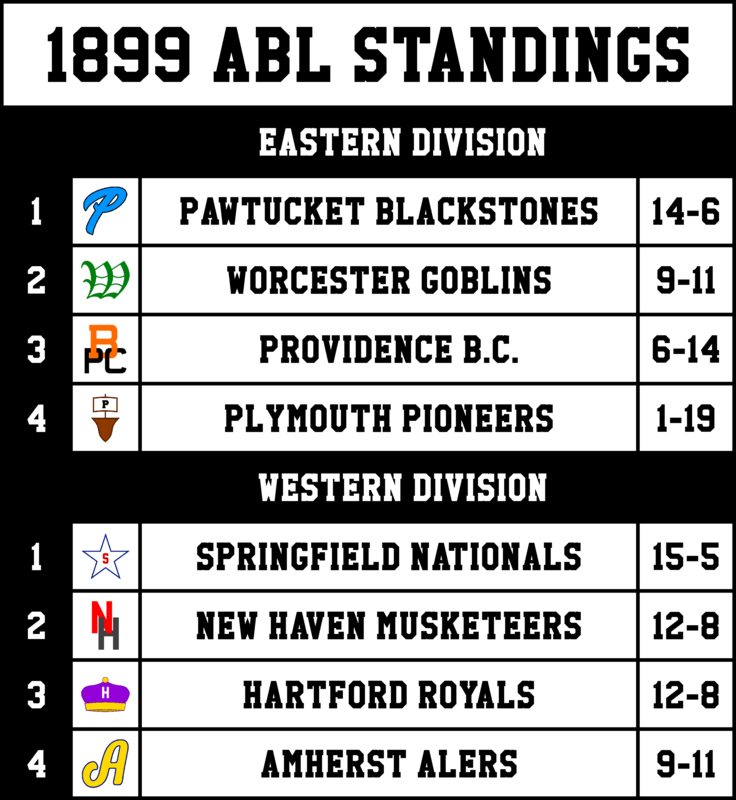 After going 9-11 in 1899-00 and finishing last in the Western Division, the Alers improved to 13-7, gaining their first playoff bid in franchise history. 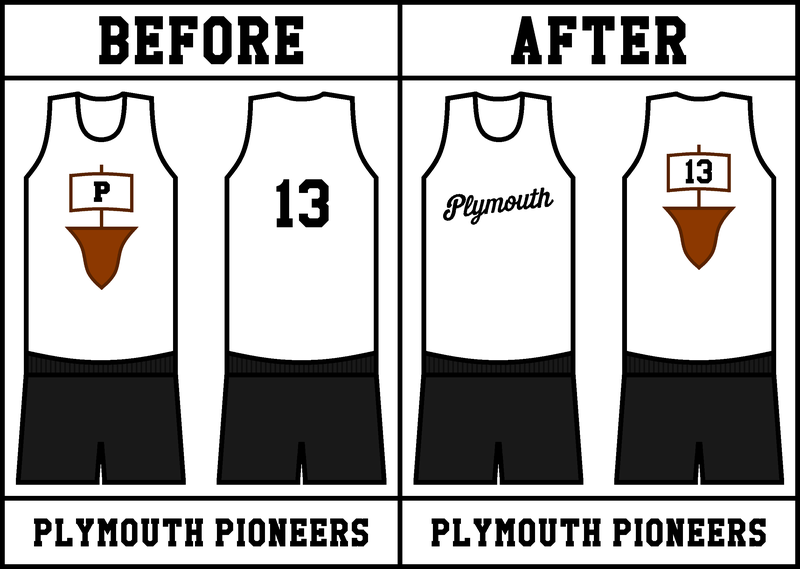 Another surprise team was the Plymouth Pioneers, who improved from 1-19 to 8-12 in just one offseason. In an interview owner Melvin Fox said "Maybe it was our new jerseys, maybe some of Springfield's past success did rub off on us." Pawtucket was the best team in the league this year, and are the general favorites to repeat as ABL Champions. The Blackstones were once again led by star (and MVP) Mel Kings, who averaged 17.1ppg. They also received contributions from center Ron Hammonds, who averaged 9.9ppg and 8.1rpg, to go along with 2.2bpg. Dan Savino, Worcester's point guard, had a breakout season, averaging 15.5ppg, 7.2apg, and 3.1spg. Forward Benny McCloskey continued his success from 1899-00 averaging 14ppg and 5.6rpg. Springfield was nagged by injuries for a large portion of the year, and their 13-7 record is a testament to just how deep their team is. 1899-00 MVP David Myers broke his foot in just the second game of the season, and defending DPOY Len Rogers was bothered by a recurring elbow injury throughout the entire season. Backup guard Carter Jamison filled Myers' role nicely averaging 12.9ppg, and backup forward Ian Longley picked up some of Len Rogers' minutes while averaging 8.3ppg and 6.9rpg. The Amherst Alers, the surprise playoff team, were led by first-year guard Timothy Fredrick, who averaged 18.2ppg and 4.1apg. First-year coach George Albright won COTY, rising the Alers from last to 2nd in the Western Division. Game 1: Worcester upsets Pawtucket, winning by 8. The Goblins were led by Ben McCloskey who scored 17 and grabbed 11 boards. 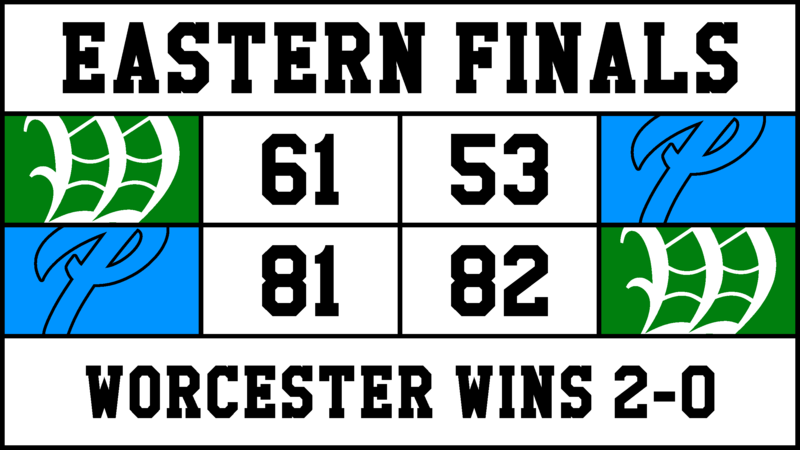 Game 2: Worcester wins game 2 (and the series) by 1 in triple overtime. Dan Savino sets a playoff record with 43 points. 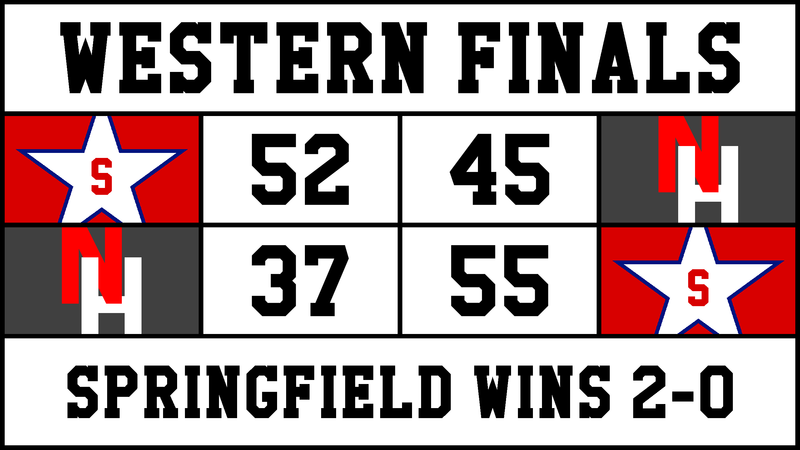 Game 1: Springfield gets an easy 13 point win at home. In his first game back, David Myers scores 21. Game 2: Springfield wins the series in Amherst, making this their second straight ABL Championship appearance. Game 1: David Myers stays hot, scoring 20 and helping the Nationals win by 1 at Worcester. Game 2: The Nationals all but clinch their second title, going up 2-0 before heading back to Springfield for Game 3. 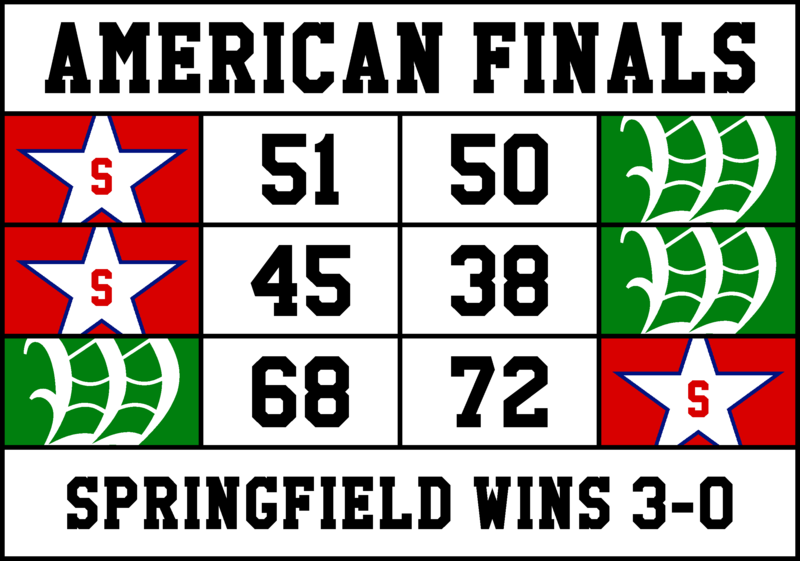 Game 3: Springfield win by 4, winning the series 3-0 behind 19ppg by David Myers. The Springfield Nationals are your 1900-01 ABL Champions! At the end of the 1900-01 season, Providence Basketball Club owner Bert Fogley announced that the team would "cease to exist" by the end of the offseason, due to a lack of fan support and revenue (since the more successful Pawtucket Blackstones were close by). After hearing the news, Comissioner James Naismith made it known he was looking for a new owner, from any city/state to start up a new team. In late July, Harold Hatchkins, a 48 year old businessman (and basketball fanatic) proposed a new team to play in Cape Cod, Massachusetts. 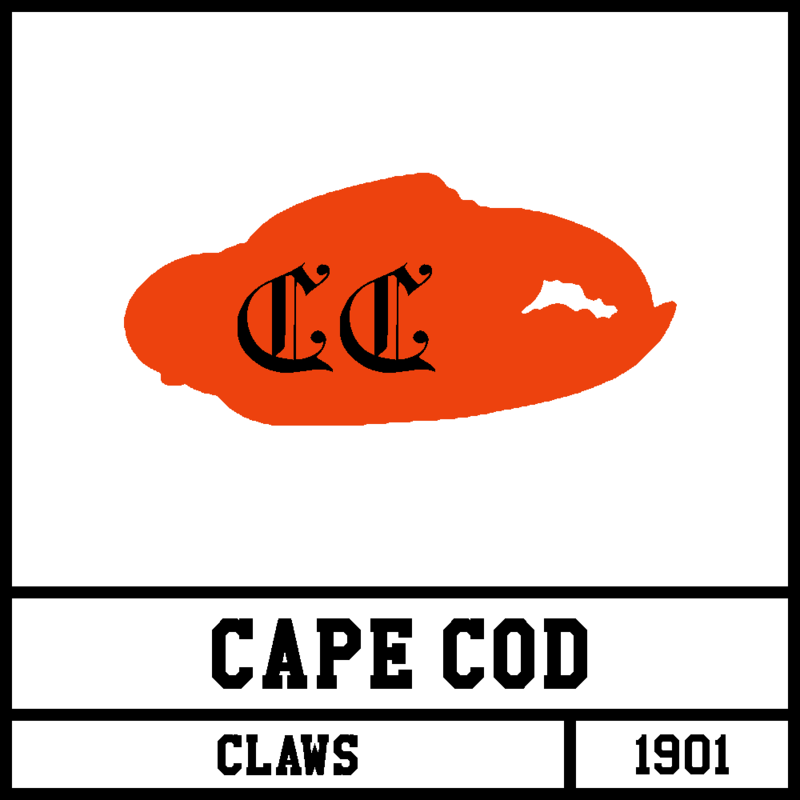 After a weeks' deliberation, Naismith, along with his ABL council, approved the new franchise; the Cape Cod Claws. C&C on the C.C. Claws is encouraged and appreciated! The third year of ABL play had very similar results as the inaugural season. 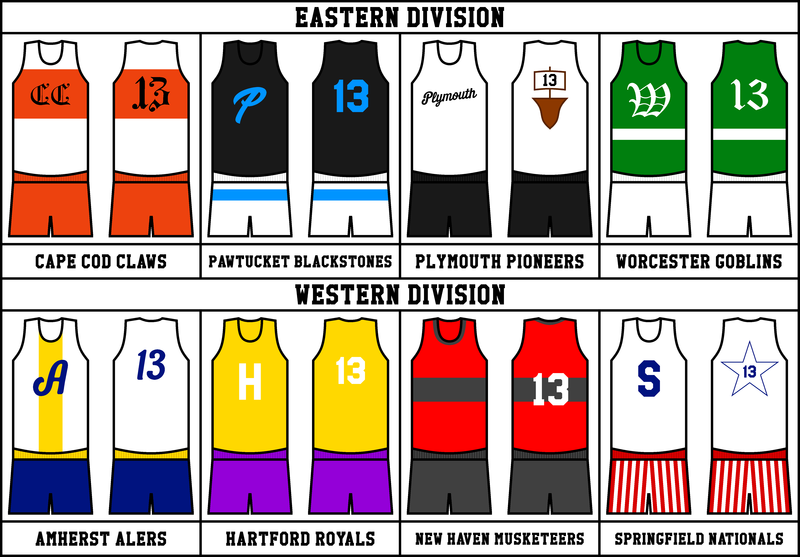 Plymouth and Amherst rounded out at the bottoms of their divisions, and Hartford and Cape Cod (formerly known as Providence) finished in 3rd. 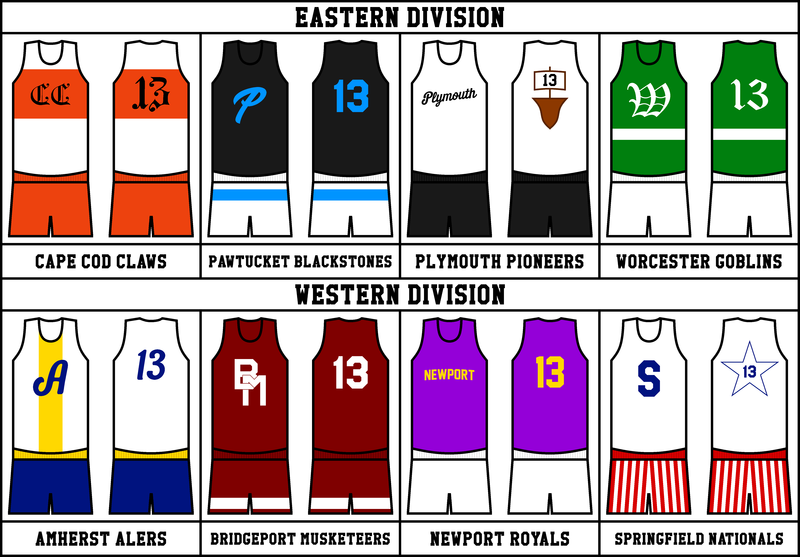 However, the top two teams in each division flipped, with Springfield and Pawtucket coming in second, and Worcester and New Haven finishing in first. Amherst started the season just 0-9, but a 5 game non-divisional win streak buffed them to 5-9, before they ended the season going 1-3 in their final 4. 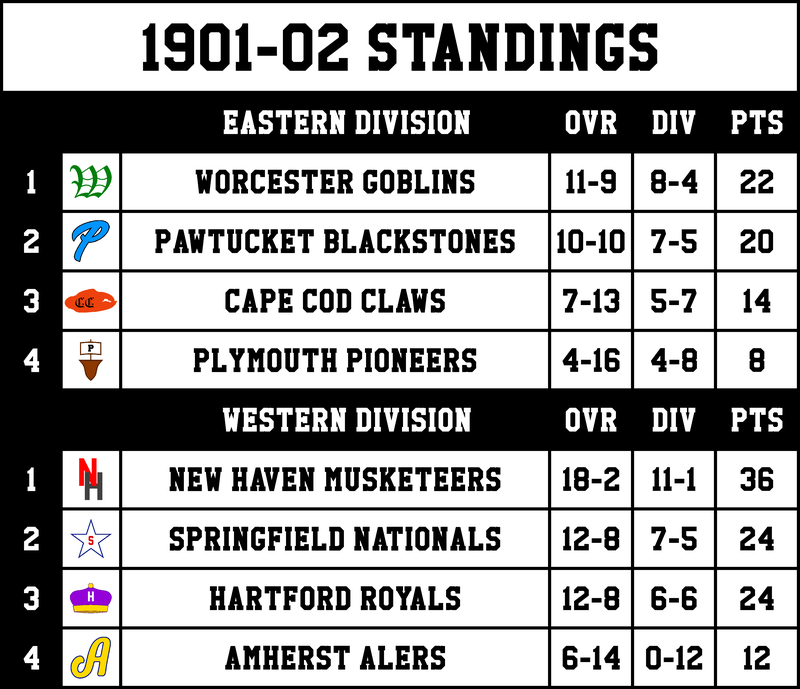 The western division was once again dominant, as the Goblins of Worcester would have been in 4th had they been in the west, but were 1st in the east. The Goblins were once again led by Dan Savino who led the league in assists and steals. Forward Benny McCloskey has a rough season, and was benched in the 14th game, but backup Frank Hatfield made big contributions averaging 10.3ppg. Pawtucket's 2nd place finish can be attributed to the injury to star Mel King on the first play of the season. After stepping on a teammate's ankle, King missed half the season, and when he returned was not the same. In King's absence center Ron Hammonds took on a bigger scoring role, going from 9.9ppg last season to 11.8ppg this year. New Haven set the record for most wins in an ABL season behind consistent play from guards Walt Babson and George McWright. Babson led the league in scoring with Mel King hurt at 14.7ppg, with McWright adding another 12.1ppg. Forward Jack Klein was also big, averaging 8.1ppg and 6.2rpg. Springfield's age seems to be catching up with them. They dropped to second place this year, barely earning it due to an extra divisional win over Hartford. Former MVP David Myers had his worst season to date, averaging just 10.9ppg and 1.9apg. Game 1: Worcester defends their home floor, getting a 9 point win a low-scoring affair. Game 2: Worcester advances by an 18 point outing by Dan Savino. Game 1: Springfield upsets the Musketeers in New Haven behind David Myers' 21. Game 2: It seems as though David Myers is getting hot for the playoffs once again, he leads the Nationals to the championship with 18 in game 2. Game 1: David Myers gets the nickname "Playoff Myers" after he scores 32 in a game 1 blowout victory. Game 2: Springfield goes up 2-0, Myers isn't the Nationals' leading scorer for the first time in these playoffs, Carter Jamison scores 16. Game 3: Springfield wins by 14 to clinch their second straight ABL Championship, the first back-to-back in league history. With 3 games remaining in the regular season, Hartford Royals' owner Nate Morgan announced he was selling the team. After going 18-2 and losing in the first round of the playoffs, the New Haven Musketeers ownership group announced they would be relocating to Bridgeport in search of a fresh start, and hopefully more success. 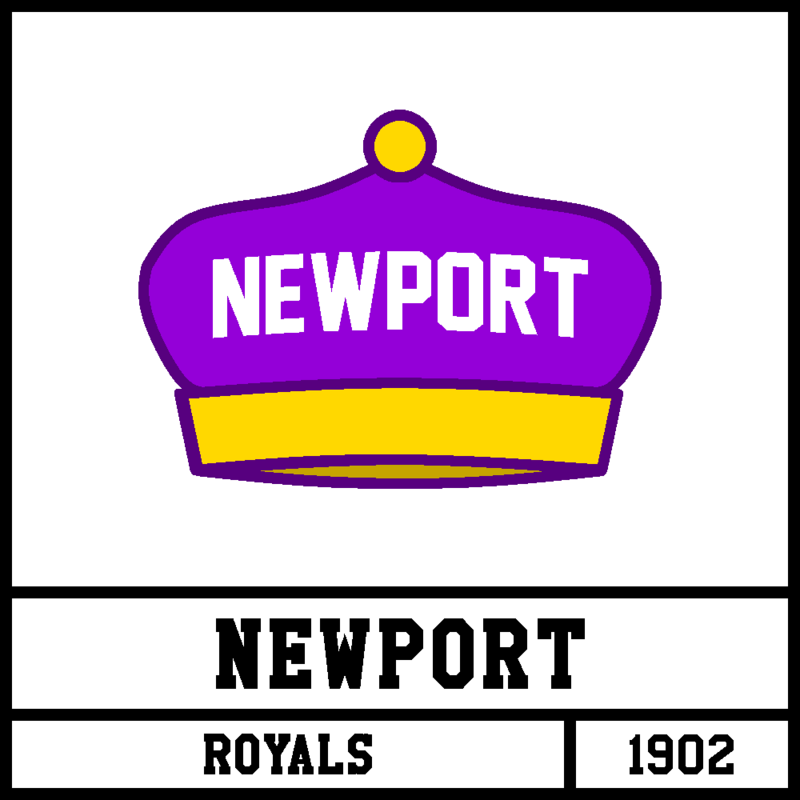 On September 3, 1902, the Hartford Royals were bought by Kenneth O'Leary, a Newport businessman. He announces he will be moving the team to Newport, RI. On October 1, 1902, both teams unveiled their logos and uniforms to the public. 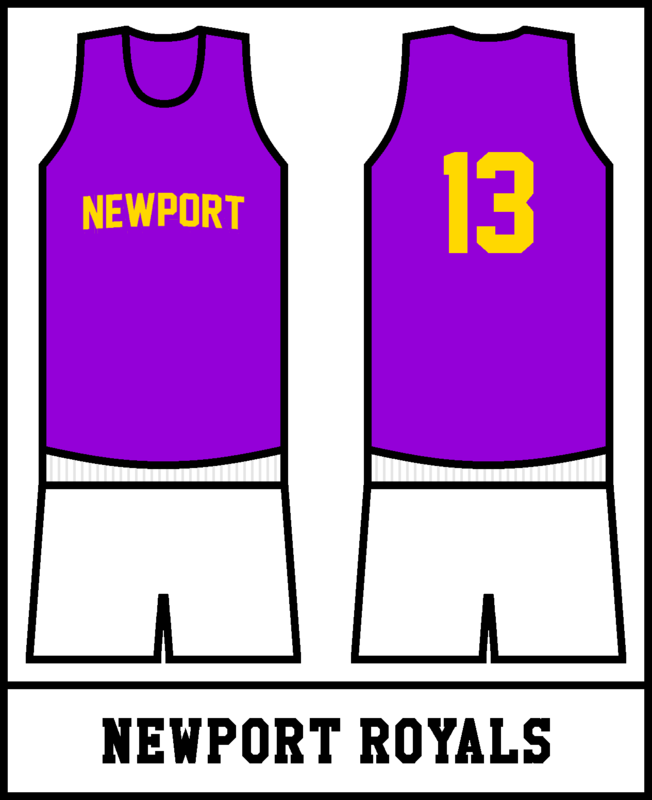 The now Bridgeport Musketeers went under a compete rebrand, and the now Newport Royals went under a minor rebrand. 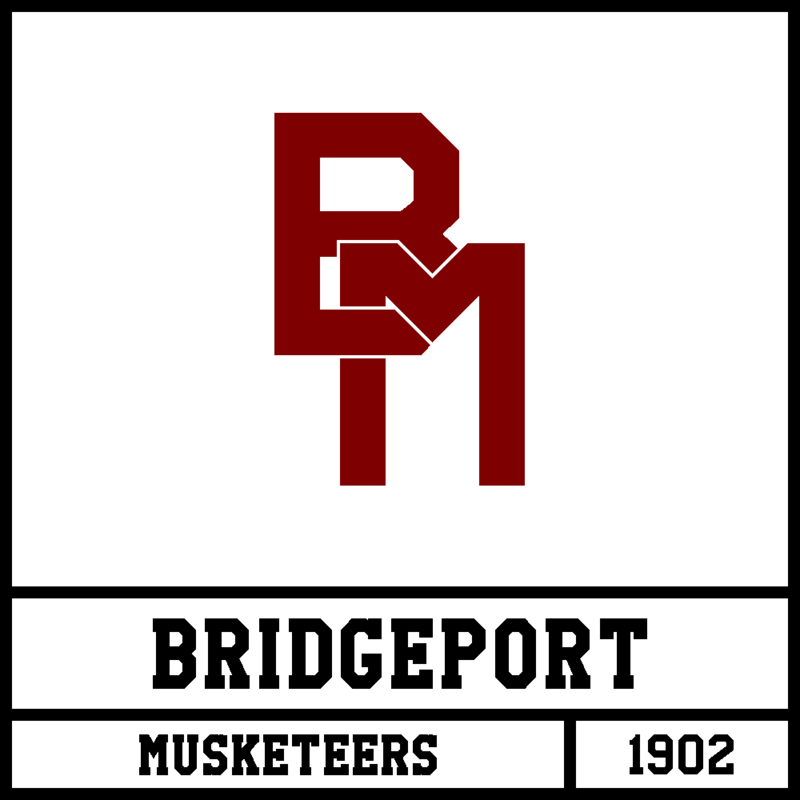 C&C on the Newport Royals and Bridgeport Musketeers is encouraged and appreciated! The 1902-03 Season saw little shift in the standings. 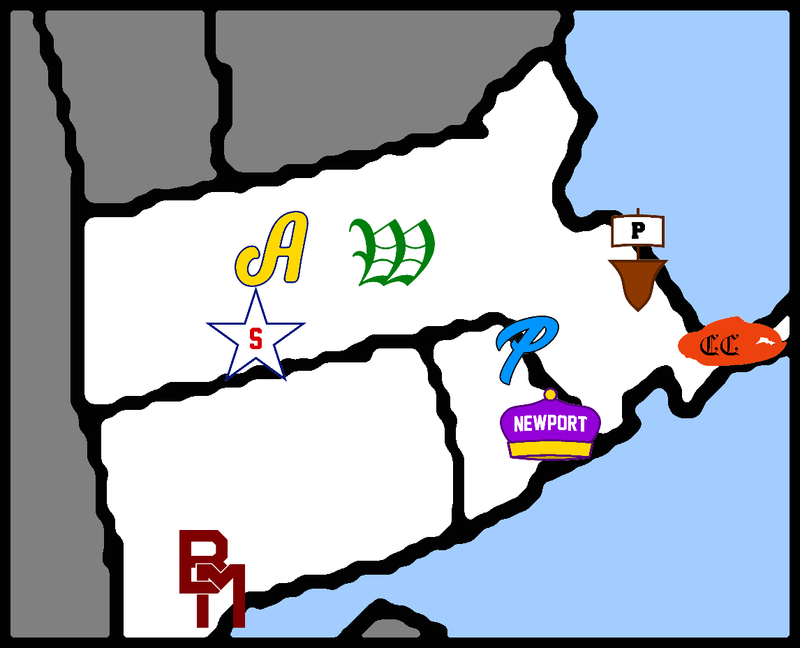 The playoffs were once again clinched by Worcester, Pawtucket, Springfield, and Bridgeport (formerly known as New Haven). One difference from years past was the shift in divisional dominance. 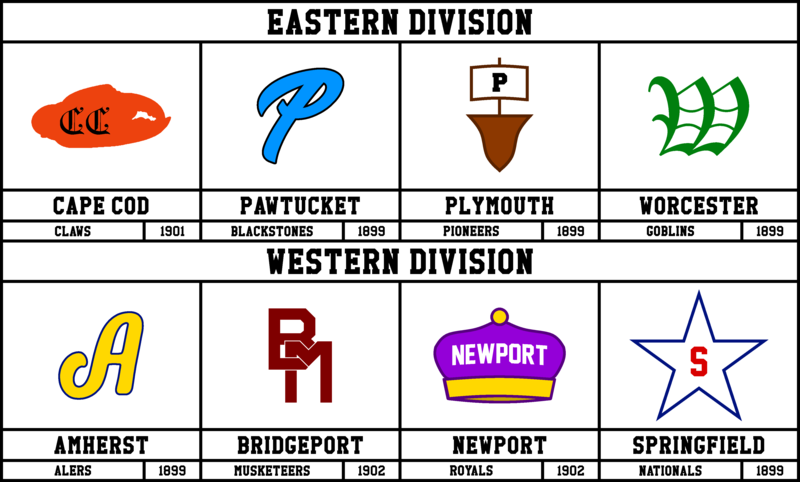 This season, the Eastern had the edge over the Western with three teams over .500 (Worcester, Pawtucket, Cape Cod). Newport started the season 3-12, but won 4 of their last 5 to finish 7-13. Plymouth's single division win came against runner-up Pawtucket 44-43 on a game winning shot. After going 0-12 in divisional play a year ago, Amherst improved to (a still measly) 4-8. 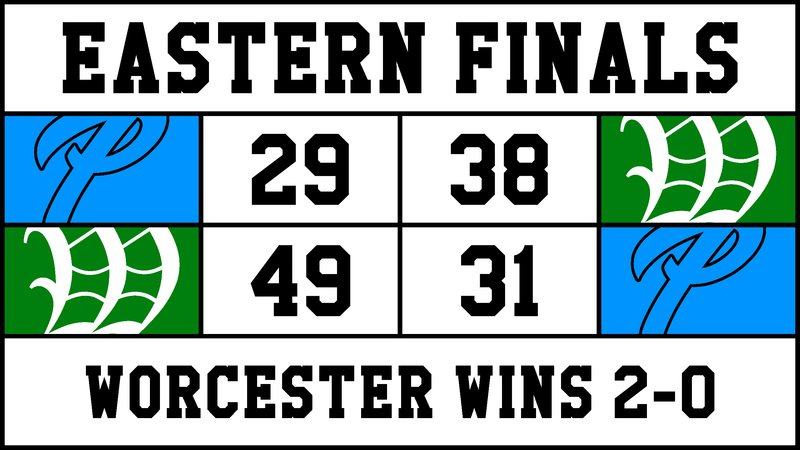 Worcester repeated as Eastern Division champs behind another great season from guard Dan Savino. He averaged 11.2ppg, 6.7apg, and 2.2spg. After 2 rough games to begin the season, forward Benny McCloskey was once again benched in favor of Frank Hatfield, who had a breakout season, averaging 13.4ppg and 5.9rpg. Mel King finally returned for Pawtucket after missing all of last season. Unfortunately for Blackstone fans, he just wasn't the same as what he was before his injury. His averages dropped, and Pawtucket wasn't 1st for the first time while he was healthy. 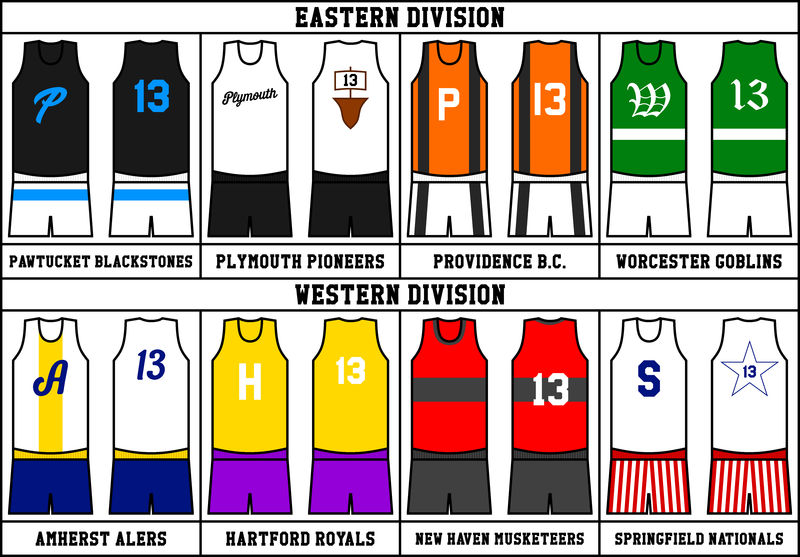 Springfield was back on top of the Western Division for the 1902-03 season. The Nationals were led by David Myers, who despite his age, led the league in scoring at 14.1ppg. After Len Rogers accepted a lesser bench role, Ian Longley had a solid season as a starter, averaging 5.4rpg and 1.3bpg. In their first year in Bridgeport, the Musketeers once again made the playoffs. Former MVP Walt Babson had another solid year, averaging 13.8ppg. He once again received help from George McWright and Jack Klein, who averaged 10.9ppg and 8.3ppg respectively.